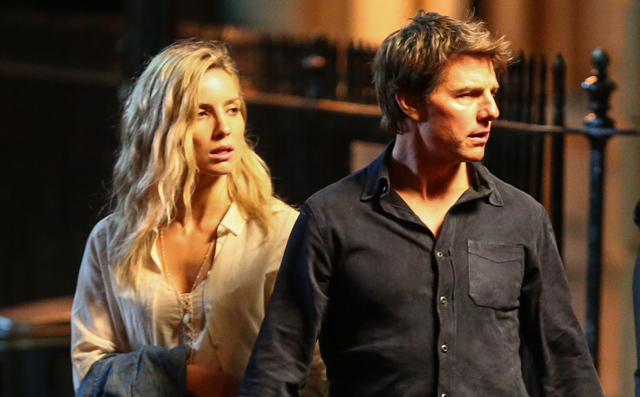 Filming is currently underway on the London set of Universal’s The Mummy reboot, and we now have our first look at Tom Cruise and Annabelle Wallis in action. Staging a nighttime shoot on the cobble streets of Oxford, England, our best guess is that Cruise and Wallis’ characters are on the hunt for some form of Egyptian relic or ancient clue, possibly sending them off to the sun-kissed plains of Egypt. Rooted in a modern-day setting, we do know that Cruise will be headlining the studio’s overhaul as a former special forces soldier, though how exactly that ties into the plot is still up for question. Joining that crusade is Jurassic World and New Girl star Jake Johnson, who was summoned to the cast a month ago as a fellow soldier to Cruise’s hero, whereas Kingsman: The Secret Service breakout Sofia Boutella will assume the role of the titular deity. Directed by Alex Kurtzman, Universal’s reboot of The Mummy has persevered through two relatively significant delays – the second of which bumped the film to a primetime release date of June 2017. Keen to infuse a sense of ancient mythology into the historical action flick are Chris Morgan and Sean Daniel, who will produce alongside Kurtzman. With plans in place to ignite a shared monsters universe – comprising Frankenstein’s Monster, Dracula, the Invisible Man, the Creature from the Black Lagoon, and the Wolf Man – Alex Kurtzman’s reboot of The Mummy will hope to jump-start a franchise when it opens on June 9, 2017.